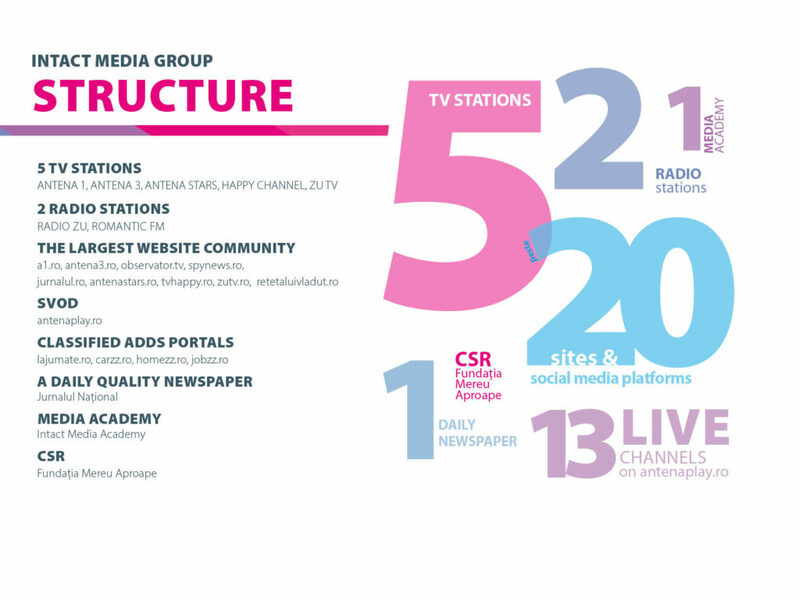 Intact Media Group is the largest media platform in Romania based entirely on local capital. Founded in 1991 as a family business, the group now includes a landmark family of TV channels, a successful radio division, digital operations, one of the most enduring print titles, as well as and other complementary services. All IMG activities combined contributed to the public budget with more than 400 million euro over the last 10 years. The group’s family of channels (Antena 1, Antena Stars, Antena 3, Happy Channel, ZU TV) have an average daily reach of 10.343.000 Romanians on a national level during whole day and of 7.716.000 during prime time*. Antena 1 is Romania’s iconic entertainment channel, whereas Antena 3 stands as the undisputed leader of the news niche. Antena Stars sets the showbiz agenda while Happy Channel militates for a feel-good approach to life. Dedicated to the millennials, ZU TV captures their fresh& free spirit. Radio ZU is the most dynamic brand in Romania, leading audiences in Bucharest since its launch, while Romantic addresses a more mature, sophisticated audience. The IMG digital division includes leading websites in their categories such as a1.ro, as well as the strongest on-demand platform in Romania, Antena Play. The division also features lajumate.ro, the ultimate classified ads portal in Romania. The landmark publication Jurnalul continues a long tradition of offering the latest news and opinions, enjoying popularity in its online version too. The group is heavily involved in the social responsibility area, through Mereu Aproape Foundation. During its entire activity, The Mereu Aproape Foundation has raised more than 10 million Euros, which were directed to 1.000.000 beneficiaries. The acknowledgments received over the years confirm the relevance, creativity and quality of the content created by Intact Media Group. Numerous national and international distinctions, including APTR, UK’s Association for International Broadcasting awards (AIB) New York Festivals, an International Emmy nomination and Antena 3’s affiliation to CNN, certify our dedication to quality content. During its 25 years of activity, Intact has grown hundreds of media professionals. At the same time, the group is responsible for training a new generation of media professionals. Intact Media Academy has become the most important educational project in Romanian media, accredited by the Ministry of Labor, Family and Equal Opportunities and the Ministry of Education, Research and Youth.